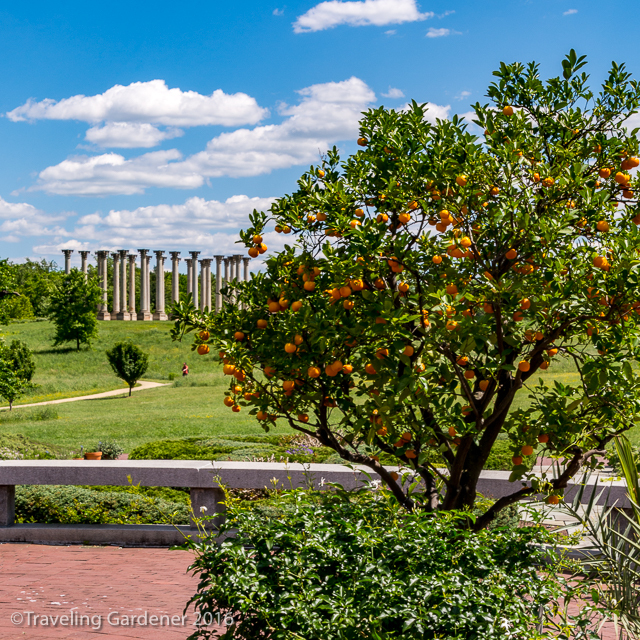 Peace & Tranquility in Washington D. C.
Lost in the nonstop news coming out of Washington D.C. today is news of the remarkable treasures of our U.S. National Arboretum & Botanic Garden, “Where Science meets Beauty”. 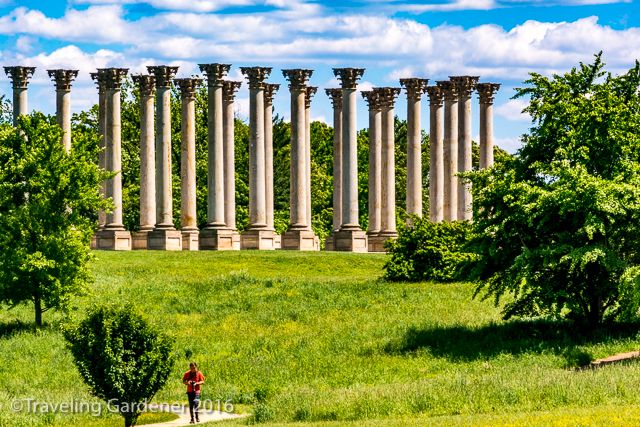 Since 1927 the National Arboretum’s mission “to combine science and beauty for the study of flowers, shrubs, and trees” has thrived, thanks to the Department of Agriculture. 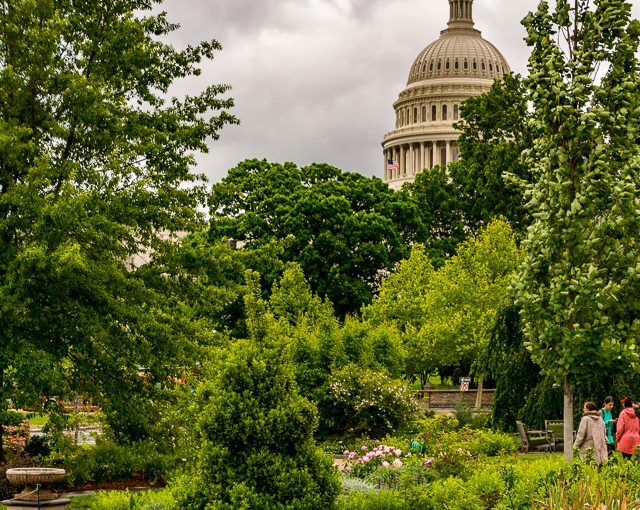 Located away from the National Mall in NE Washington, DC, is 446 acres of a green oasis in a densely populated area of the country. A visit here removes you from the politics and the traffic of the area. 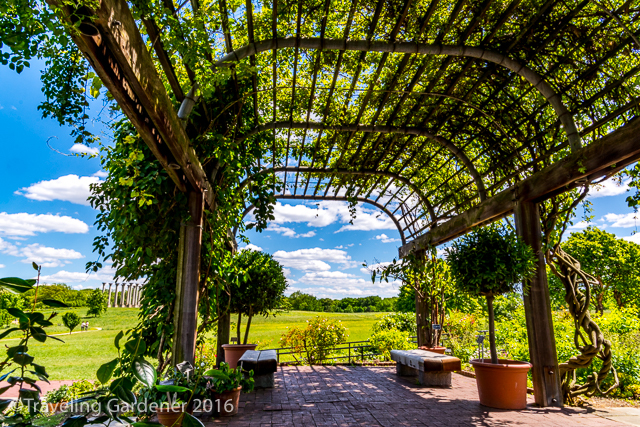 There are formal gardens, herbariums, bonsai, and grand trees. There is so much to explore, if you hope to see it all you need a map and a plan to cover the nearly 10 miles of roadway. Visitors can travel by car, or bike. The arboretum works to make “scientific discoveries contributing to sustainability of landscapes”. The research is part of the nationwide network of Extension Services (including the University of AZ) as well as international cooperation. Here is where the work of the USDA Plant Hardiness Zone Map is done. The interactive map lets me put in my home garden zip code. The mission statement reminds me that American the Beautiful is in reference to our vast and varied landscape. 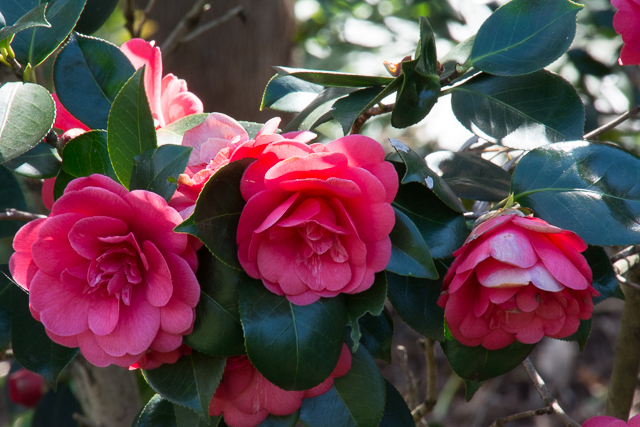 Spring is an especially beautiful time in the Arboretum as 10,000 Azaleas and 1000 Camellias, which have been hybridized to withstand the colder temperatures of the D.C area, burst into bloom along with daffodils, crocuses, magnolias, and other seasonal flowers. A pair of Bald Eagles, ‘Mr. President’ and ‘The First Lady’ has been adding to the excitement of the season for the past four years nesting in the top of a Tulip Poplar tree and raising their chicks. A live streaming Eagle Cam allows for observation (https://www.dceaglecam.org) during the nesting. There are also viewing scopes on site to observe the nest. 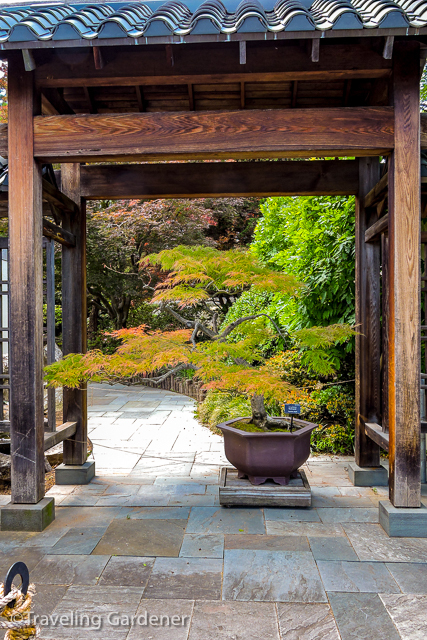 Considered to be one of the finest collections in the world, is the small forest of dwarf confiners and Japanese Maple trees, a gift of William Gotelli. 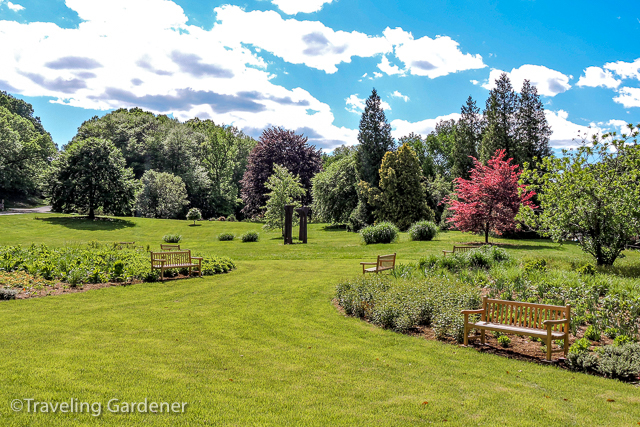 In 1962 Gotelli donated 800 dwarf conifers to the arboretum from his New Jersey garden. These dwarf evergreens sweep, droop, and twist in delightful shapes. There is a National Grove of State trees and flowers bringing together the flora and fauna of the country. 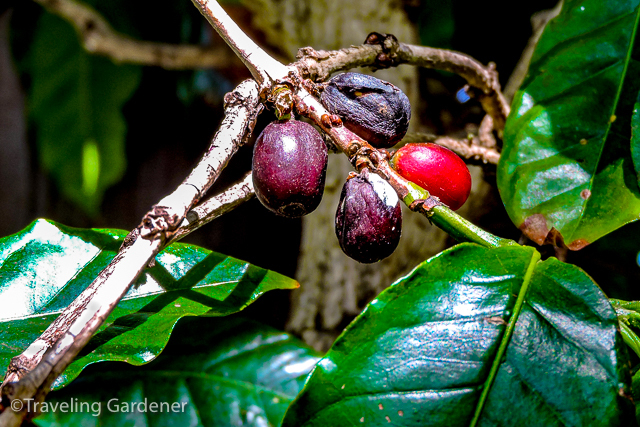 A Beverage Garden highlights plants used for herbal teas, liquor, and coffee. 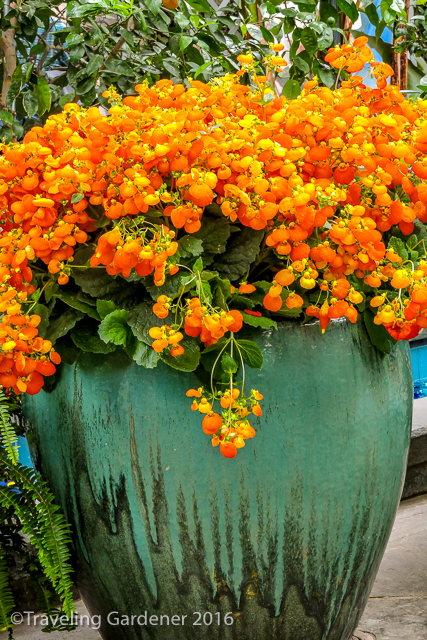 A sweet scent filled the air in the Fragrance Garden which displays plants used for aroma and perfumes, and an Industrial Garden features plants that supply sources of fuel, fiber, and other essential products to keep the world running. In 1976, as part of the celebration of the nation’s bicentennial, the National Bonsai & Penjing Museum was established. Bonsai is the Japanese art of miniature trees and Penjing is the Chinese form. Today there are 150 miniature trees in this collection including the work of North American Masters. 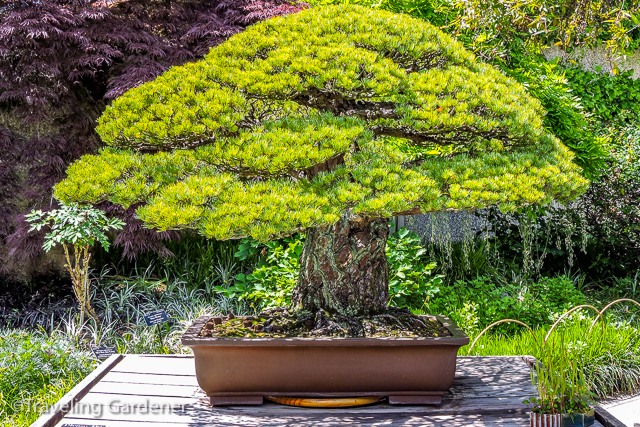 The oldest tree (in training as a bonsai since 1625) is a Japanese White Pine, a gift of Masaru Yamaki. This tree survived the August 5, 1945, atomic blast in Hiroshima. This precious tree, given 30 years later to the U.S. as part of a gift of friendship from the people of Japan represents the healing power of nature between two countries once devastated by war. 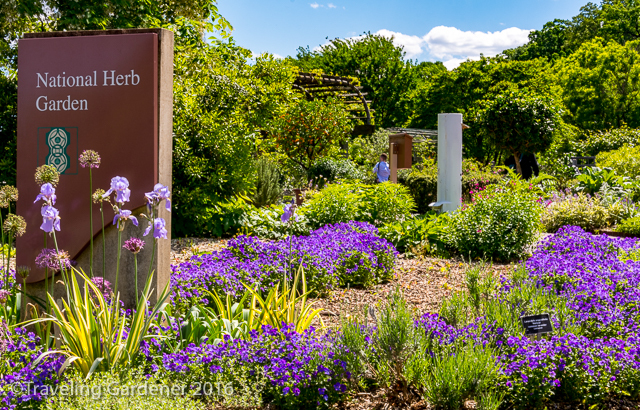 This is where my plan to explore the entire Arboretum fell apart as this collection of grand horticultural art fascinated me. 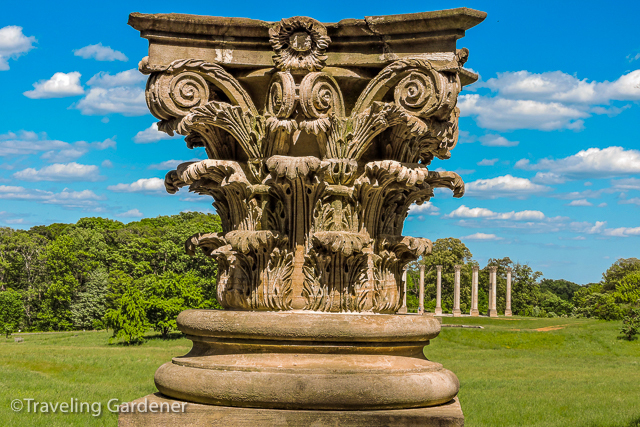 The most thrilling site of the arboretum is the 22 Corinthian Capitol columns sited on a knoll of the Ellipse Meadow. The columns were constructed in the early 1800’s from Virginia sandstone to hold the Capitol Building dome. Undersized from the beginning, the columns were replaced in 1958. But it was not until 1980 that the idea for their relocation to the Arboretum took shape. It is quite a story of how they ended up here. The impact of these columns standing tall, complete with a reflecting pool, is beautiful and thought-provoking. The Greeks influenced the Romans and the Romans influenced the western world in language, politics, philosophy, education, and architecture. Corinthian columns, a symbol of classical Greek architecture, from the country where the ideas of democracy began, stand peacefully while the tumult of a living democracy continues. 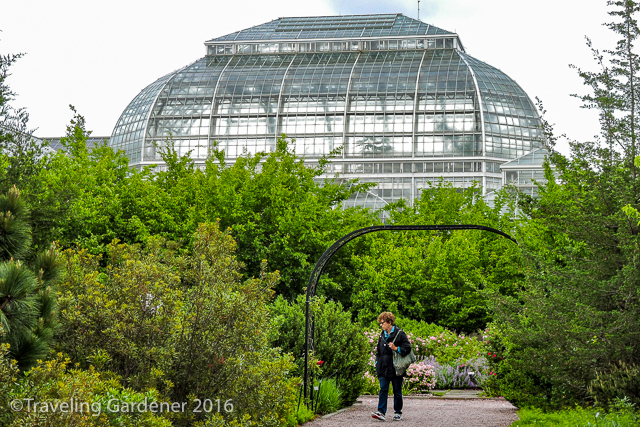 A separate but no less significant place for a gardener’s attention is the U.S. Botanic Garden located on the National Mall. It was established by Congress in 1820 during the height of international excitement of plant exploration and discovery and continues operation today as part of the Library of Congress. Purposed to be “a botanic garden to collect, grow and distribute plants of this and other countries that might contribute to the welfare of the American people,” this small garden represents the historic collection of 1000’s of plant specimens dating as far back as 1842 gathered by Columbia Institute for the Promotion of Arts and Sciences the first plant exploration effort by our fledgling nation. Today any plants confiscated at the U.S. borders as a violation of Convention on International Trade in Endangered Species of Wild Fauna and Flora (CITES) comes here to be rescued. 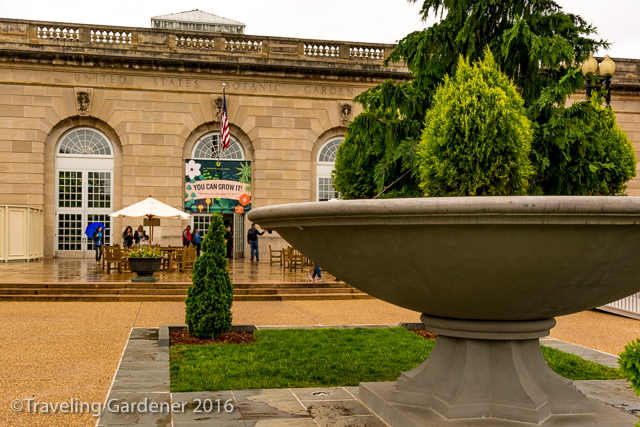 Escaping a rainy day, I ducked inside to explore the historic Lord & Burnham 1933 Conservatory, the architectural centerpiece of the garden. Two courtyard gardens, display halls, and 10 garden rooms safe inside under glass attempt to represent our national landscape. Always a pleasure to read about your travels. The pictures are beautiful. Extraordinary beauty, captured in exceptional photographs. A national treasure! 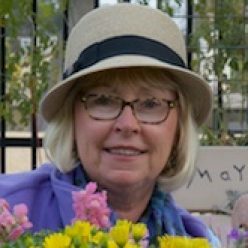 Thank you, Linda. Loved the wisteria. Another place to put on the list. Interesting about the bonsai tree. The columns are a wonder. 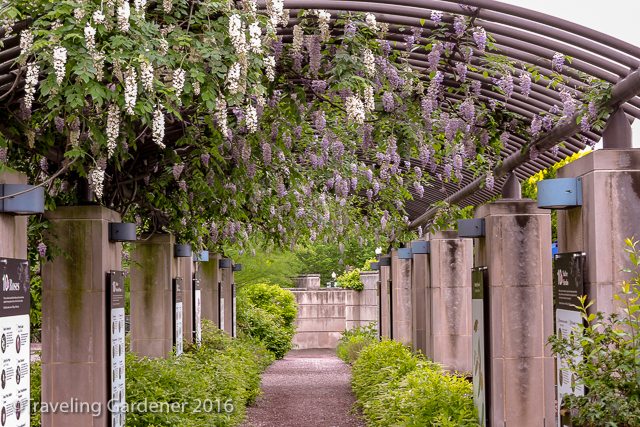 Wisteria garden is beautiful. It seems be very large garden. I like the conservatory. Thank you for taking me on this journey. Beautiful pictures, especially the wisteria. If only my wisteria would bloom. I’ve had it for 20 years.